Artist Steve Farleys ridealong with local firefighters was a life-changing experience. 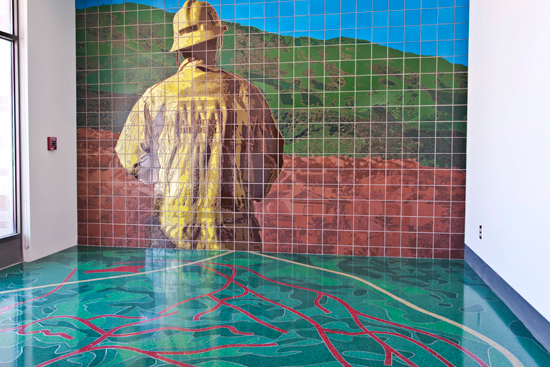 Despite his lineage as the grandson of a Los Angeles County firefighter, Farley confesses that he had never before grasped the true nature and depth of a firefighters work. Over the course of a night and a day, he and the firefighters responded to eight different emergency calls, seven of which were medical in nature. 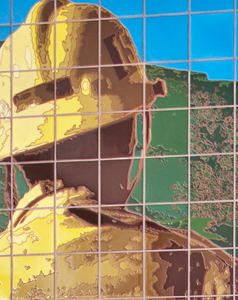 He was struck by the firefighters poise and dedication during these extreme situations.Using this experience as inspiration, he developed a tribute to those Keeping Watch over the Santa Clarita Valley for the lobby of Fire Station 150. 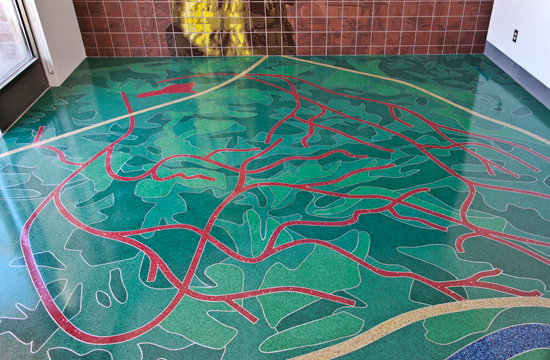 The artwork includes a conceptual aerial map (14 x 14) on the station floor made of crushed marble terrazzo. The map details the areas main arterial roadways in yellow and the Santa Clara River in blue. The arteries of the human heart overlay the map in red, representing the firefighters' commitment to protecting the health and heart of the community. Fire Station 150's location is indicated by a red fire helmet (taken from the official seal of the Los Angeles County Fire Department), and a pointer arrow in the lower right hand corner indicates which way is north on the map. 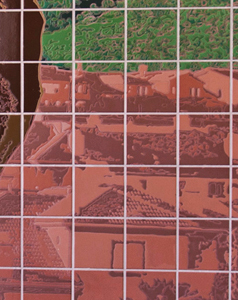 A glazed ceramic photographic tile mural covers the north facing wall (9 x 14) with an image of a firefighter watching over the Santa Clarita hills. Viewed from the back, he is meant to represent all firefighters past and present..
tilography is a trademark of tilography llc. the tilographic process and "look and feel" are protected by laws of the United States and other major countries. we protect these rights vigilantly. all rights reserved by tilography llc.